Angus passed away yesterday afternoon. His lymphoma spread quickly, and he was in quite a lot of distress, and had stopped eating…anything. With the lymphoma and the cushings, and now with the lymphoma spreading quickly and into the intestines, the staff just couldn’t put him through anymore. They didn’t want the little man to suffer needlessly. Angus thought he would have time to make a proper goodbye. But in the end, he just didn’t feel like doing anything. So I am taking charge and notifying you beloved readers, his friends, everyone of you. So, looking as much as I could emotionally take at his old pics, I found one from 10 years ago. April 2005. One you haven’t probably seen before. 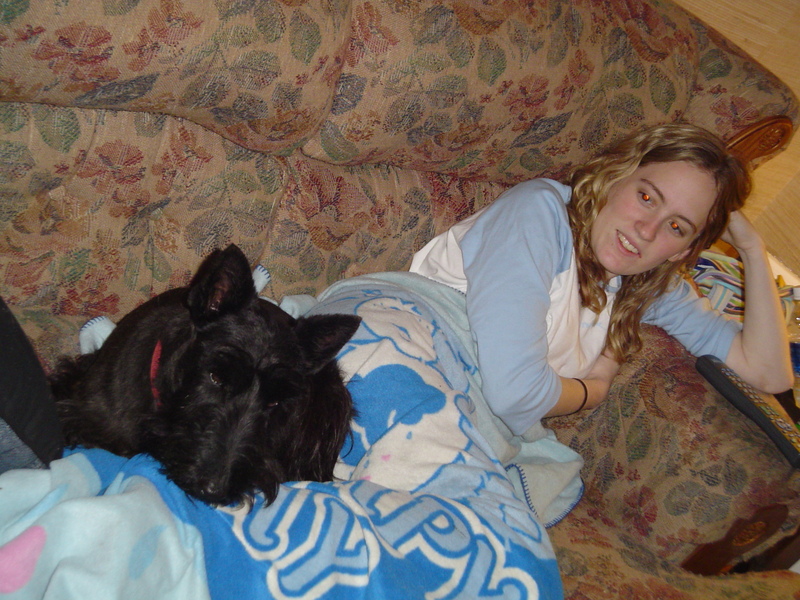 Just a pic of Angus (looking a lot like me, I dare to add) with his beloved hooman sis, while she was still at home and in high school. Just an ordinary picture of an ordinary day of an extraordinary Scottie. By the way, as the new chief executive of Angus Fala Worldwide, I will be taking over this page soon. I never could pretend I’m Angus, and can’t manage like him, and don’t have his voice. Though we are blood, I’m my own Scottie. But I’m gonna take a little break before I start posting here. I’m sure you understand. Thank you for continuing his legacy. I look forwards to your posts. Sending schugs to you, Catman, and Mama. Yes, Angus taught you well, You’ll be able to continue in your own Ainsley style- You don’t know, maybe someday you’ll even hire a little brother or sister. Mama just yesterday said with Angus’s steady paw and influence, I’m gonna turn into a cat in just a couple of weeks. I wonder what she meant by that? Ainsley, Please take all the time you need. Thank you for posting, Ainsley. Angus would be proud of the way you are taking charge. He’d still criticize and roll his eyes and call you a moron but that would be Angus. To know that you will continue on, or soldier on in Angus speak, is commendable and brave. You have huge shoes to fill but I am sure you will bring solid scientific research to back up your findings and observations. I know that many are looking forward to reading your blog and we are grateful to have this blog continued whenever you feel up to it. Much love to you and your family at this very sad time. I feel the same, a kiss to you Ainsley! Take all the time you need, sweet girl. It takes a while to heal, gain perspective, etc. Hugs to you all. Angus Fala was writing this blog because the Zuckerman was throwing pet accounts off Facebook. Well, in true Angus fashion he showed that Zucker who was in charge of if and when he would leave FB. God speed dearest Angus, you will be missed. We at our house know Ainsley, you will be up to filling those huge paws he has left behind. I treasure all the fun I have had reading and participating in Angus’ escapades. At rest now soldier. Having just gone through this, we know how you feel. You have no bird to take over the blog? The decision to help them cross is easy when they’re suffering and the quality of life is a minus number. Angus was fortunate, most Scotties don’t get to celebrate their 13th birthday. I have always delighted in the fact that Angus and I share birthdays…a big one for both of us coming up. We should still celebrate Angus on May 5 th, don’t you think? Ainsley, you will have your own voice, one that we will all be looking forward too. As Trisha Jones, points out, Mr Bear needs to be kicked to the curb. ASAP. Oh No….we have not know you very long…and we already miss Stg. Angus…we know he is with all the other Scottie buddy’s running the show….Ainsley, we know once you decide to post again you will carry on the great tradition Angus made….we have lots of prayers for you and Mama. Angus Fala​, I will always remember what a good sport you were. Letting the hoomans put those silly hats and sunglasses on you and take your picture, stuff most of us pooches put up with! But you’d do anything to make your peoples smile. I meant, would not put up with! Sweet Ainsley. Thank you for continuing his legacy. You and I were blessed with the greatest brothers in the world. And while you may be sad, just remember he is always in your heart . And Angus will probably still be whispering commands to you! We look forward to hearing more about Ainsely’s adventures. With lots of love to you and your family, Rosy, Annie & Mom & Dad. Stopping by to leave our condolences, purrs and slow tail wags for you and your humans. So sorry. Words can’t describe the pain a lot of us are feeling with the loss of our beloved Angus, but v we’ll be here for you Ainsley. We love you too! !! We didn’t know Angus, but we are sorry for your loss. I was so sad to see the news about Angus. But I will imagine him running and playing ball at the big dog park in the sky. Lab hugs and luv to you all. We will be here, Ainsley. It takes time to adjust to new realities and to grieve. Me and Nellie are very sad to read of your loss. Our doggy thoughts are with you at this time. Take you time little Ainsley !!! we will be waiting for you! Discovered this blog through Kismet, the bird. So sorry to hear about Angus your uncle-brother, Ainsley! You’ll do great writing for him. Angus lives on and we welcome you as the Director. He fought the good fight and now it is your turn to give voice. Just be yourself & we look forward to reading your post after your break. My heart aches for you. I am so sorry for your loss. My deepest sympathy and warmest wishes. We are so terribly sorry to hear of Angus Fala’s passing. Run free until we meet again. We are so, so, sorry. We know how hard it is to lose a furry loved one. Our Uncle Fergus passed away from the big C two years ago (he had cushings too). My heart just did flip flops and tears in my eyes. I understand what Angus was going through and his humans. May G-d’s blessings be with all of you and Angus. He is now at the Rainbow Bridge giving orders even to my Duffy you died so too soon. I’m so very sorry for your loss. We remember Duffy very well. Angus loved the present Duffy sent him shortly before Duffy died. Edgar sent us over. It’s always heartbreaking. We’re sending hugs to everyone. Written words cannot express my sorrow. Angus made me laugh every day. I’m so sorry for your loss. Thank you for sharing his life.